Packing up human skulls, 1948. 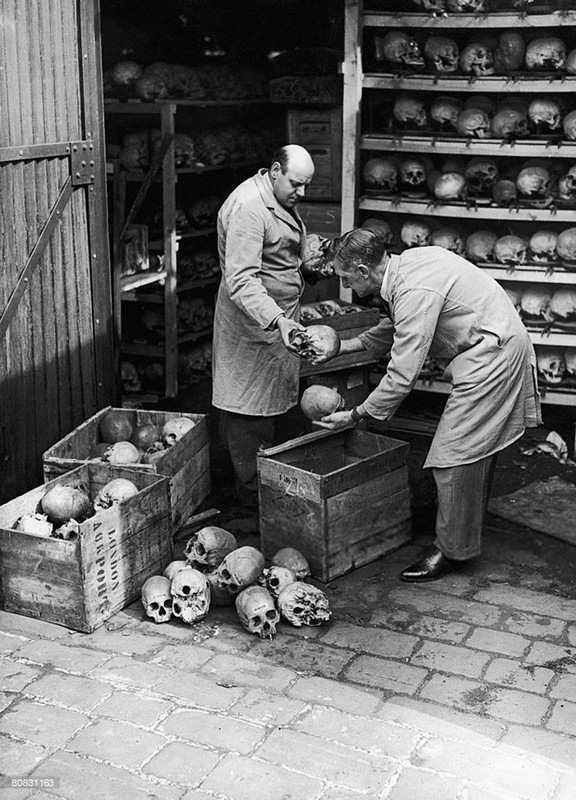 Attendants from the Hunterian Museum of the Royal College Of Surgeons packing up some of the 3,000 human skulls stored in a shed in Lincoln’s Inn Fields, London, before their transfer to the Natural History Museum, July 1, 1948. The skulls include those of Chinese pirates, Eskimos and Maoris. Each of the skulls has a serial/catalog number on the forehead. Many institutions in the United Kingdom possess a variety of cultural items and human remains from countries around the globe. The vast collections stem from centuries of exploration and the growth of the British Empire through colonization. Collecting cultural items and human remains from other countries has been documented at least as far back as the fifteenth century. For the period after the fifteenth century these items, collected locally, were used to study differences in human populations and the origin of the human species, with items from overseas being brought back only if they were “rare or unusual specimens… for their curiosity value as well as for research”. The nineteenth century marked an increase in the acquisition of human remains from various countries, predominantly those under colonial control. These were acquired for scientific purposes, to study evolution and the origin of the human species, as well as in response to “a desire to preserve mementos of what were believed to be vanishing races”. These remains were acquired from a variety of sources, including transfers from foreign museums and trade with indigenous people. Some remains were acquired without consent from the indigenous population in colonial times when there was an uneven balance of power. Since the 1990s many Western countries have implemented laws to return the human remains from former colonies or conquered peoples. New legislation includes the 1990 Native American Graves Protection and Repatriation Act in the US, and the 2004 Human Tissues Act in the UK.